Well, it's finally here: the trailer for the final installment of the Skywalker Saga. And with the trailer we finally get a title: The Rise of Skywalker. Considering that Luke Skywalker seemed to buy the moisture farm at the end of The Last Jedi, we can't help but wonder just which Skywalker is about to rise. Will Luke be returning from the dead? Will we discover Rey's true parentage? Or does is the title referring to something more subtle — and much harder to guess? J.J. Abrams and the rest of the folks at Lucasfilm and Disney packed a ton of stuff into the two-minute trailer, and we can only guess at what some of this stuff might mean. But rest assured — a lack of actual knowledge never stopped us from speculating wildly about what we might see when Episode IX hits theaters in December 2019. 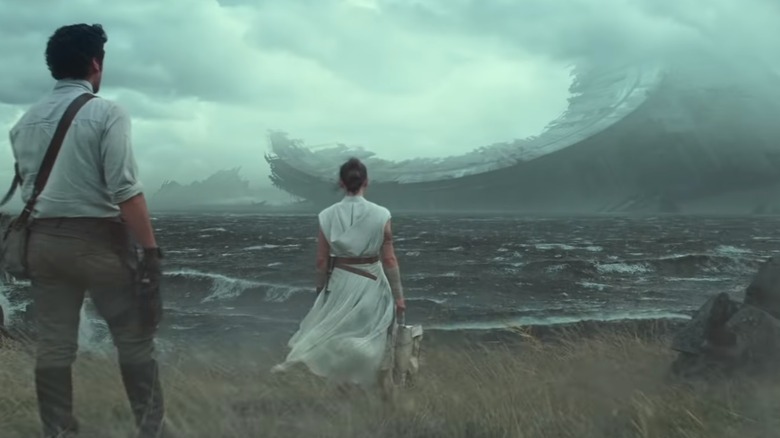 Crack open your Wookieepedias and dust off your holocrons — here are the small details you might've missed in the first trailer for Star Wars: The Rise of Skywalker. 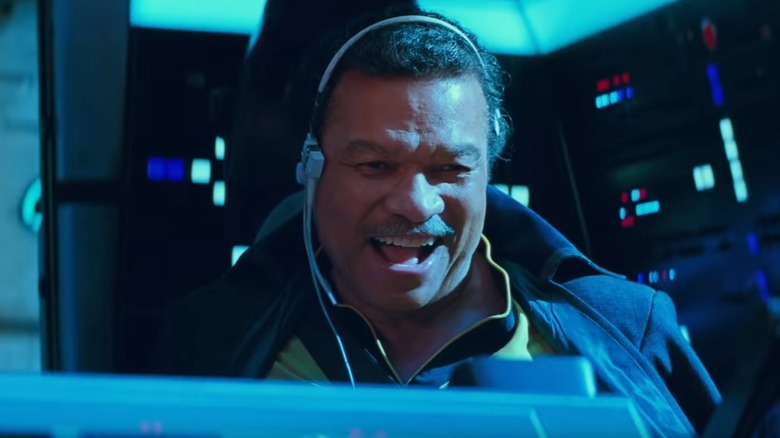 After two mainline movies' worth of fans constantly wondering where smooth operator Lando Calrissian (Billy Dee Williams) might be hiding, the teaser finally confirmed that he'll return in The Rise of Skywalker. And he's right back where fans last saw him 36 years ago at the end of Return of the Jedi, sitting in the pilot's seat of the Millennium Falcon and having a grand old time. His co-pilot this time out isn't rebel smuggler Nien Nunb — who incidentally is still active in the Resistance movement. Instead, it's none other than Chewbacca, who is accompanying Lando on a jump through hyperspace. Where are they headed? A very brief shot of a battle scene looks like it may take place in Lando's old stomping grounds, Cloud City. Of course, fans have seen Lando in a movie since Jedi: 2018's Solo: A Star Wars Story, where he was portrayed by Donald Glover instead of Williams. Interestingly, Williams seems to be wearing the same (or at least a very similar) yellow-and-black costume as the one Glover wore in the prequel. Perhaps he's trying to recapture the swashbuckling days of his youth? Or maybe it's just so newer fans will recognize him. Arguably the most touching moment in the first teaser for Star Wars: The Rise of Skywalker is the brief shot of Leia and Rey embracing in a forest-like setting. A single tear runs down's Rey cheek as Luke's voiceover intones, "We'll always be with you." 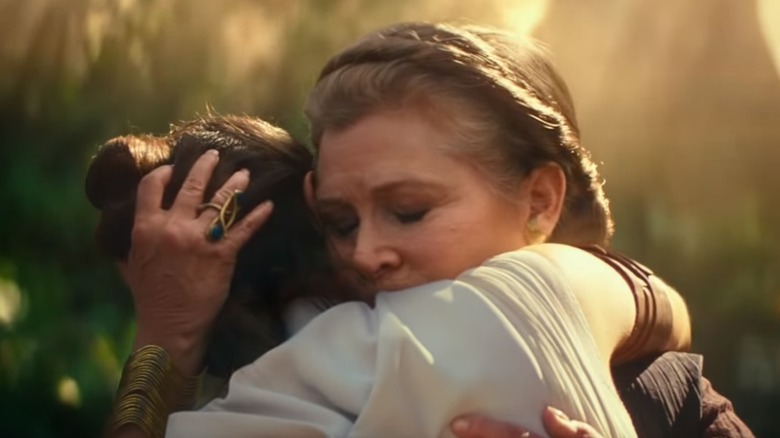 While the in-universe context for this heartfelt hug is still unknown, we do know that scenes featuring the late Carrie Fisher in The Rise of Skywalker are actually unused clips from The Force Awakens. Much to the relief of Fisher fans worldwide, Lucasfilm announced in July 2018 that her character would not be resurrected via CGI, as Peter Cushing's Grand Moff Tarkin controversially was in 2016's Rogue One. Instead, Abrams and his team would find a way to work with "a number of scenes that had gone unused" from Episode VII, as the director told the crowd at the Star Wars Celebration 2019 in Chicago. "The idea of having a CG character was off the table. We never even wanted to try. And the idea of saying, 'Well, what if we could actually write scenes around her?' So it would be her performance. She's in the movie," Abrams said. So while it's still unclear why, exactly, Leia and Rey are sharing this particular moment, we know that it's not just a tacked-on deleted scene. Whatever it was that prompted this embrace in the Episode VII script changed the course of Episode IX's story, one way or another, meaning Fisher had a posthumous influence on the direction of the Star Wars universe — a fitting tribute to the legendary Leia. 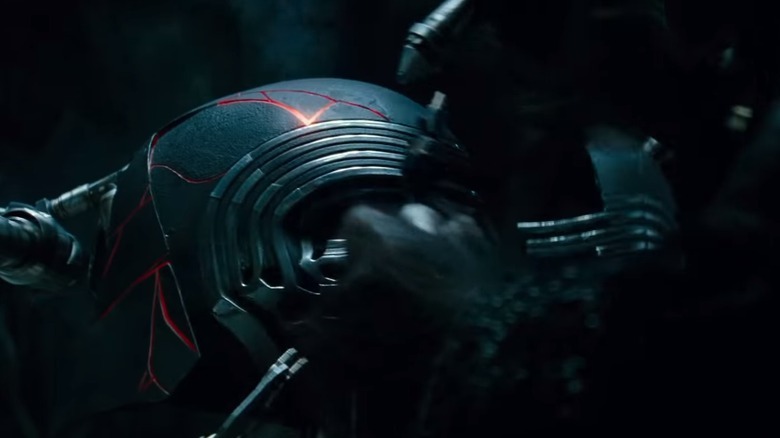 There's one moment in particular that has hyperventilating fans reaching for their inhalers: the moment where we see Kylo Ren's iconic helmet being carefully pieced back together by a mysterious — and hairy — figure. In The Force Awakens, that mask was in many ways the key to who Kylo Ren was — or wanted to be, at least. Unlike his grandfather, Darth Vader, Kylo Ren didn't need the mask. But he chose to wear it as an outward symbol of the person he was willing himself to become. In The Last Jedi, though, Kylo Ren smashed the mask in a rage. That too, was symbolic. His whole character arc in The Last Jedi saw him questioning his decisions and struggling with who he was. Rey tried to redeem him by tempting him back to the light side, and he wavered. Some part of him was still Ben Solo. But in the end, he chose again to embrace the dark side. So it would only be fitting if he once again donned the mask. He knows who he is now, and it's not Ben Solo. It's Kylo Ren, the inheritor of Darth Vader's legacy — and the mask is an outward symbol of who he has finally chosen to be. Beyond Rey's prequel-style feat of Force parkour, the biggest money shot in the Rise of Skywalker teaser is the shot of our next generation heroes paying a visit to the wreckage of a massive Death Star. You may be familiar with these. The question lingering over this shot is: which Death Star is this? In the series so far, we've seen only two super-weapons of this particular design: one in the first Star Wars, which was blown up at the Battle of Yavin, and another in Return of the Jedi, which was blown up with the Emperor on board above the forest moon of Endor. Recency bias and the Emperor's well-timed cackle in the teaser suggest that this wreckage is of the second Death Star. But the surroundings — misty and unforested — look less like Endor, and possibly more like Yavin IV, where the original Rebels first made their base. Of course, this being Star Wars, this well could be a third, fourth, or sixty-sixth giant super-weapon that we never got to see on screen before. The most important thing is that it looks cool, and in that case — hey, mission accomplished. Way back at the end of Star Wars: A New Hope, the closing scene saw Princess Leia awarding medals to Han and Luke. We never found out the significance of those medals or what they represent — outside of being given for "excellence in Death Star destruction." And we never saw them ever again… until the teaser for Star Wars: The Rise of Skywalker. At about the 1:33 mark, we see a pair of older-looking hands cradling one of the medals that belonged to Luke and Han. While we can't see whose hands they are, it doesn't seem like much of a stretch that they might belong to General Leia. 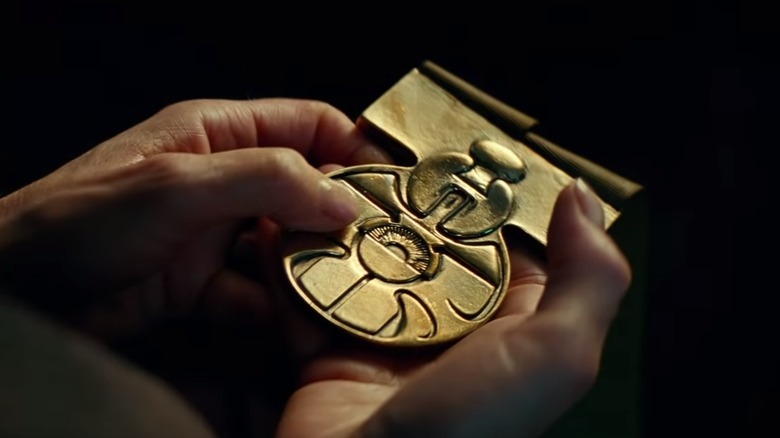 We also can't know if this is Luke or Han's medal, though either one would make a potent memento for Leia to be holding during the Skywalker Saga's epic conclusion. But let's take an educated guess: with all the footage we see of a desert locale, the voiceover provided by Mark Hamill, and the title The Rise of Skywalker, there's a good chance that Luke's medal might be instrumental to whichever Skywalker will be rising by the end of this film. At the very end of the trailer, audiences are treated to one final tease before the title. The screen cuts to black, and an ominous laugh plays over the darkness. Long-time fans might have recognized that cackle as one that sounds eerily similar to Emperor Palpatine's. How? Okay, stop us if you've heard this one: A long time ago, in a galaxy far, far away, Palpatine fell down a big hole and blew up. The end. That seems like a pretty serious injury to come back from. But as multiple films have proven, nobody in Star Wars is ever truly dead, if the narrative calls for it. And it's probably no coincidence that Luke's voiceover, which concludes directly before the laugh, all but confirms this when he says, "No one's ever really gone." 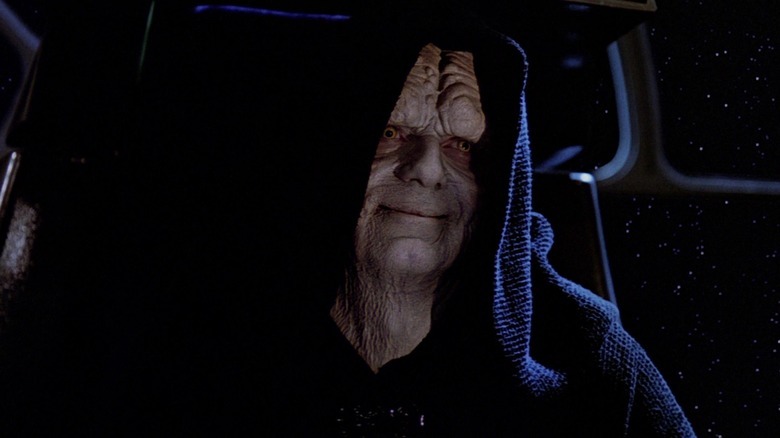 If that is in fact Palpatine's laugh — and actor Ian McDiarmid's appearance at Star Wars Celebration just after the trailer's debut seems to indicate that it is — there are a few possibilities for what it could mean for Episode IX. First, he's back! With Snoke out of the picture, the upcoming film will need a big baddie to raise the stakes. But we also have Kylo Ren seemingly stepping into that role, so another possibility is that the laugh comes from a hologram of Palpatine. 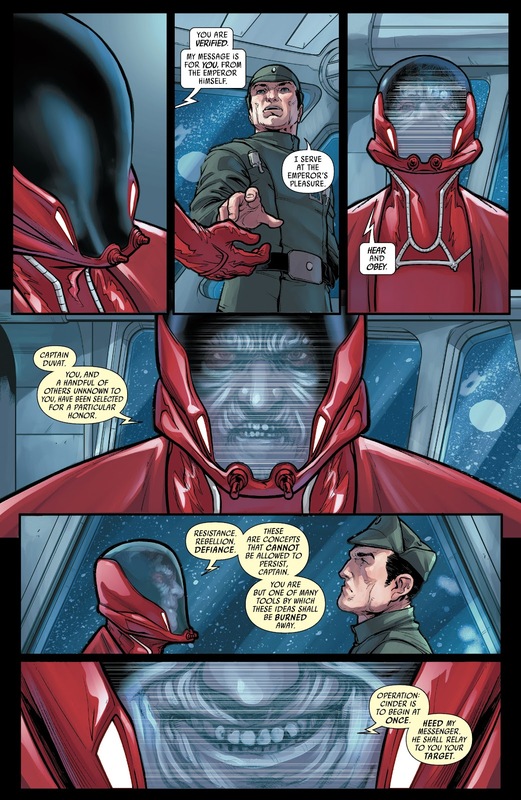 As the 2015 comic Shattered Empire showed, the guy wasn't above giving orders after his death via holograms. Maybe Rey and the gang discover an old recording in that beat-up Death Star wreckage. Maybe it's Kylo's ringtone. Or, hey — it could be a big ol' misdirect. We'll have to wait to find out. The first minute or so of the trailer shows Rey going it alone against what seems to be Kylo Ren's Tie Interceptor. 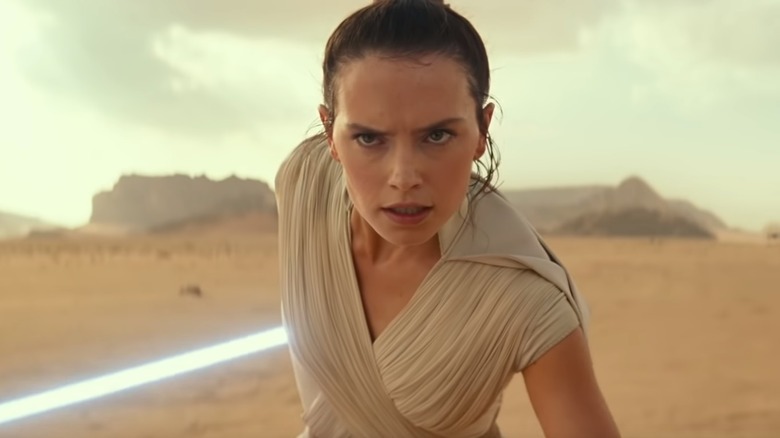 While the epic-looking action scene is tense and exciting enough, what's really interesting is the setting — Rey is in the desert, and that might mean some big, big things. 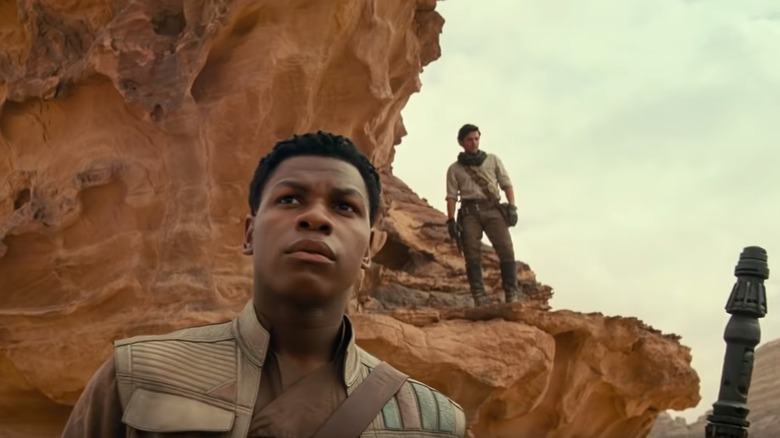 In fact, several scenes in the trailer seem to take place in a rocky, desert-like setting — like the one featuring Finn and Poe on a rocky outcropping, and the explosive speeder chase that has strong echoes of Return of the Jedi. Unless you're new to this whole Star Wars thing, you may know that our heroes have made quite a few trips to the desert — both in the movies and in the TV shows. We've seen the twin-sunned Tatooine several times throughout both the prequel trilogy as well as the original trilogy, while The Force Awakens switched things up by introducing us to Rey on Jakku. Meanwhile, Star Wars Rebels, which details the events before A New Hope, spends a lot of time on the rocky, sandy planet of Lothal. So where do these scenes take place? 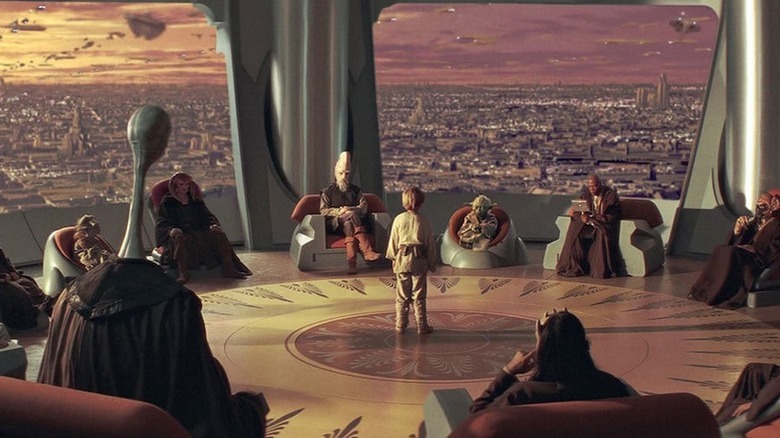 Again, it's impossible to say for now, but let's follow the several Skywalker clues and guess that it's one last trip back to Tatooine — the planet where this whole Star Wars mess started — before we close the book on this persistent family for good. Not much is known about the latest droid to appear in the Star Wars universe — and, soon enough, on Christmas 2019 shopping lists. But we do know that this unicycle with a megaphone for a head is named D-0, as confirmed by The Rise of Skywalker director J.J. Abrams at the Star Wars Celebration 2019 in Chicago. Introduced during the panel as BB-8's "new friend," D-0 was met with cheers and plenty of "awwws" as he appeared at the feet of the panelists. As for D-0's appearance in the teaser trailer, he's confined to just two shots. 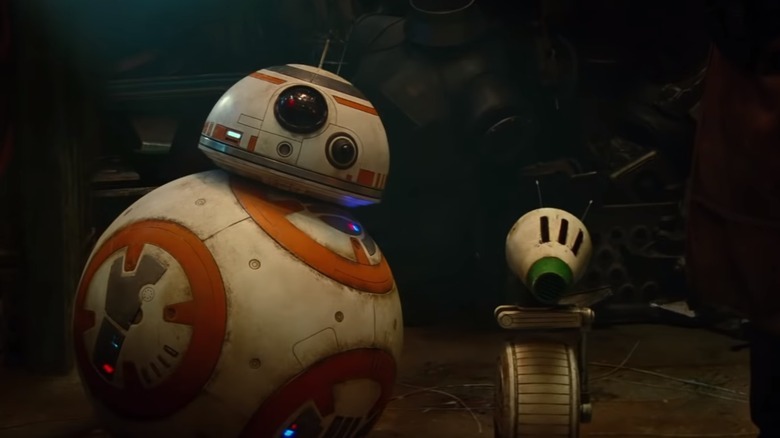 He first pops up tilting his head adorably alongside BB-8, and then once more with the core group of resistance heroes on what could be Endor. D-0's origin is unclear, but what is clear is that he's going to make a lot of children happy — and likely upset Star Wars diehards who don't care for the cuter side of the galaxy far, far away. Movie teasers tend to do exactly what they say on the tin, offering up fleeting images and scarce hints over real substance. The real takeaway from the Episode IX teaser isn't the footage. It's the movie's title, The Rise of Skywalker — a kind of off-the-wall choice. In practice, the title signals a hard commitment to referencing the nine Star Wars episodes as the "Skywalker Saga" — a name we won't know the full significance of until the series is all wrapped up. For years, the name Skywalker has referred to just Anakin and Luke, with the eventual reveal that Leia was a Skywalker too. 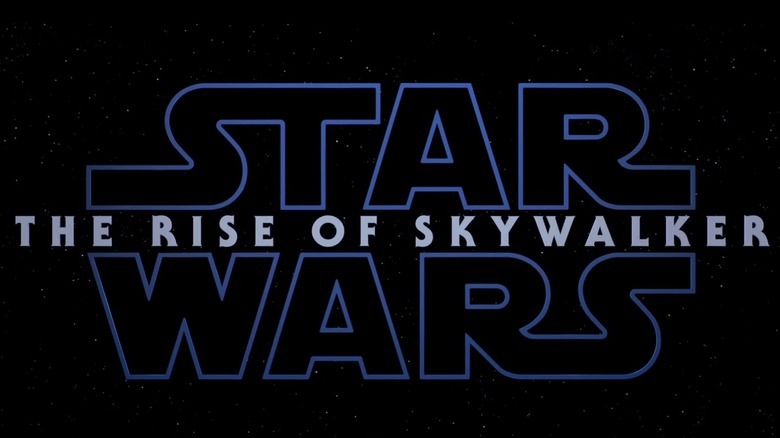 But the Rise of Skywalker title feels like it elevates the name above and beyond reference to one mere family. At the end of The Last Jedi, both Luke Skywalker and the Jedi Order are effectively dead. Rey, a powerful Force wielder, is left with the option to revive the Jedi… or replace them. Perhaps Skywalker isn't a name anymore, but rather a title for a new kind of warrior monk. If that's the case, then Episode IX follows naming conventions set by the previous two trilogies — Revenge of the Sith, Return of the Jedi, and now, The Rise of Skywalker. It's an idea that has a chance of sounding silly if the movie comes out and doesn't go with it. But for now, right after the trailer's dropped? Absent any other information, it feels like a theory we can get behind. The trailer opens to the sound of heavy breathing — same as the trailers for The Force Awakens and The Last Jedi — then Rey's face as she steels herself for what's coming. 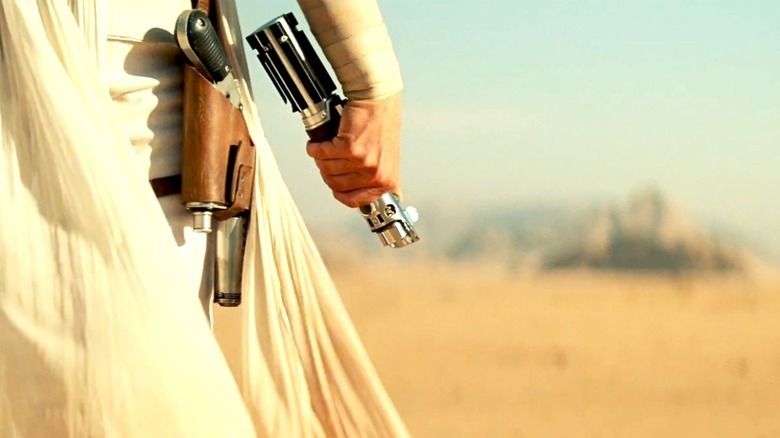 In the next few shots, we see some familiar weapons hanging at Rey's belt. The blaster was given to her by Han Solo in the The Force Awakens. Assuming that it's Kylo Ren bearing down on Rey in a speeding Tie Interceptor, the shot of Han's blaster in the foreground as his son — his killer — pursues another savage kill from the distance is both a reminder of Solo's continuing influence on Rey, and the brutality of Kylo Ren. It's also a signifier to the audience that Rey is a different kind of Jedi. Historically, Jedi knights have held disdain for the use of guns. At the Episode IX Panel in Chicago, an image of Rey firing the blaster was on display — proving that she keeps it on her as more than just a keepsake from Solo. Next, Rey draws her lightsaber. Eagle-eyed fans have noticed that this lightsaber is the same blue-bladed weapon that was destroyed in The Last Jedi during a struggle between Kylo & Rey. We see it whole once again, an indication that Rey has mastered her Jedi powers. A Jedi cannot complete her training without constructing their own lightsaber; Luke, in a deleted scene from Return of the Jedi, is shown building his. So, like her mentor, it appears Rey has gotten into lightsaber design — restoring the weapon to flawless working order. J.J. Abrams and the cast of The Rise of Skywalker have spoken about the fact that this film takes place after a jump in time from the end The Last Jedi. While they've remained tight-lipped on just how long the jump is, it's clear from the trailer that Rey's Jedi skills have developed significantly. Rey demonstrates her mastery of the Force Jump, seemingly using it to narrowly avoid being gored by Kylo's Tie Interceptor. Luke Skywalker's disembodied voice delivers the goosebump-inducing line "a thousand generations live in you now." To state plainly that a relative newbie in the ways of the Force has has digested all the knowledge in the history of the Jedi Order is a big claim. That said, recall that in The Last Jedi, Luke had traced the Order back all the way to their very first Temple at Ahch-To, where he learned their most ancient secrets — many of which had been long forgotten over the years. What other expanded or new uses of the Force will we see in The Rise of Skywalker? If "no one's ever really gone," what does that mean for the final chapter of the Skywalker Saga? 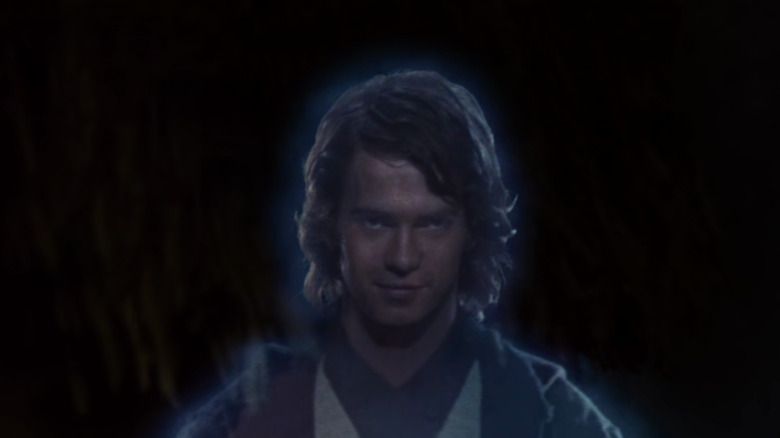 In the original trilogy we see Obi-Wan, Yoda, and Anakin all become Force ghosts — essentially a projection of identity and essence from a Force-sensitive being after their death into the realm of the living. While Force ghosts have been a part of the Jedi repertoire pretty much since the beginning of established canon, their limitations and abilities have remained largely unknown. Qui-Gon Jinn, for example, has never been seen projecting his form — only his voice — from beyond the grave. 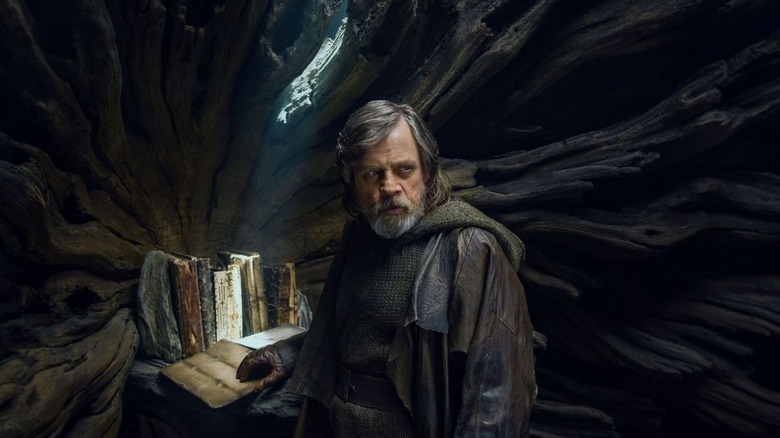 Yoda, on the other hand, is able to not only interact with Luke in The Last Jedi, but also send a bolt of lightning that destroys the Tree Library on Ahch-To. Perhaps Episode IX will reveal even more about the full extent — and impact — of this ability. Life after death works a little differently for the Dark side of the Force. While practitioners of the Light side may be able to return as Force ghosts, recent Star Wars comics have shown that the spirits of extremely powerful Dark siders may be tied to "dark artifacts." This may help explain why Kylo Ren recovered Vader's helmet in The Force Awakens — even speaking to it, asking for guidance. It also may give us a clue as to how exactly Darth Sidious might make his way back into the story. The Rise of Skywalker teaser tells us "Every generation has a legend" — and if this tagline seems familiar, it's because it was also used for Episode I, Star Wars: The Phantom Menace. This serves to remind the audience that the Stars Wars story, at its core, has always been a generational saga — hitting on the theme of legacy more than any other. As a generational story, Star Wars has seen each trilogy focus on a different generation of heroes. The prequels were about Anakin, Obi-Wan, and Padme. The original trilogy was about Luke, Han Solo, and Leia. The current trilogy has Rey, Finn, and Poe. With each generation, we see the theme of legacy evolve — from origin, to fruition, to destruction. The prequels and original trilogy talk about legacy in terms of family, birthright, and destiny. The current trilogy broadens the scope, looking at history's legacy on future generations, and the power to submit to or overcome one's fate.